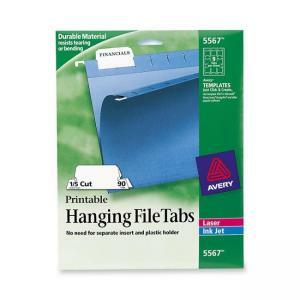 Hanging file tabs are viewable from front and back so its easy to create an organized, color-coded filing system. Sturdy one-piece tabs are designed for quick updates and easy organization of hanging files. No need for separate plastic holders. Durable material resists tearing or bending. 1/5 cut tabs make files easier to find, look more professional and save time in the filing process. Write or use your laser printer for a more professional look. Avery offers many easy-to-use Avery Templates for Microsoft Word and other popular software programs.